Education should be directed with reference to two objects—the good of the individual, and the good of the world. Wesleyan 2020 was adopted by the Board of Trustees in May 2010 as a fundamental tool for strategic decision making at Wesleyan. (See also Wesleyan Strategy Map.) Designed to be flexible, this framework for planning will assist us in making decisions about the allocation of resources in the next 5–10 years. It reflects the input of faculty, trustees, staff, alumni and students and begins with an introduction that gives a sense of some of the recent achievements that have shaped the Wesleyan of today. During the period when Victor Butterfield was president of Wesleyan University (1943-1967), higher education in the United States went through a dramatic transformation. The modern research university came into its own as a center for scientific and cultural innovation, and undergraduate education became for the first time a realistic possibility for men and women from all sectors of society. The best schools in the country took on the dual task of specialized instruction based in advanced research and general education based in the traditions of the liberal arts. During this period Butterfield guided Wesleyan to a distinctive model of higher learning: liberal arts education inspired by advanced research and open to students regardless of their ability to pay. Wesleyan was at the forefront of interdisciplinary programs that defied departmental boundaries in the service of cultivating a passion for lifelong learning, and it created support for research that allowed its faculty to contribute to advancing their chosen fields. Sophisticated experimentation in the sciences and in the arts was meant to be a catalyst for new thinking and innovative pedagogical practices, and it was. A commitment to access for groups previously excluded from higher education was meant to disrupt the “finishing school” atmosphere pervading many undergraduate programs, and it did. These developments were wedded to the ethico-political commitment to the “good of the world” enunciated by Wesleyan’s first president, Wilbur Fisk. Wesleyan University became known as a leader of progressive liberal arts education in the United States, attracting distinguished scientists, artists and scholars who saw their role as educators as a key part of their professional lives. Wesleyan also attracted a diverse community of students eager to learn from faculty who boldly pursued research and artistic practice and from fellow students who were committed to extending the lessons of that work beyond the borders of the campus. During the tumultuous years of the late 1960s and 1970s, Wesleyan was often at the forefront of efforts to open up higher education to new fields of study and to students from under-represented groups. President Colin Campbell worked closely with students, faculty, staff and alumni to ensure that Wesleyan would carve out a distinctive niche as an inclusive institution dedicated to advanced research and strong mentoring. The university’s programs and facilities expanded during this period, and new interdisciplinary centers were developed. The Center for African American Studies, which grew out of the African American Institute (founded in 1969), was established in 1974. The Center for the Arts, home of the university’s visual and performance arts departments and performance series, was designed by prominent architects Kevin Roche and John Dinkeloo and opened in the fall of 1973. By the mid 1970s, however, it was clear that strong fiscal discipline would be needed to prevent the university from spending its way into bankruptcy. Campbell and his successor, William Chace, introduced a series of difficult budget cuts along with plans for fundraising. Interdisciplinary work continued to thrive despite the budget difficulties. The Mansfield Freeman Center for East Asian Studies was established in 1987. The Center for the Americas, which combines American studies and Latin American studies, was planned in the 1990s and inaugurated in 1998. The task of liberal education, as we see it today, is to instill a capacity for critical and creative thinking that can address unfamiliar and changing circumstances, to engender a moral sensibility that can weigh consequence beyond self, and to establish an enduring love of learning for its own sake that will enable graduates to refresh their education throughout their lives. 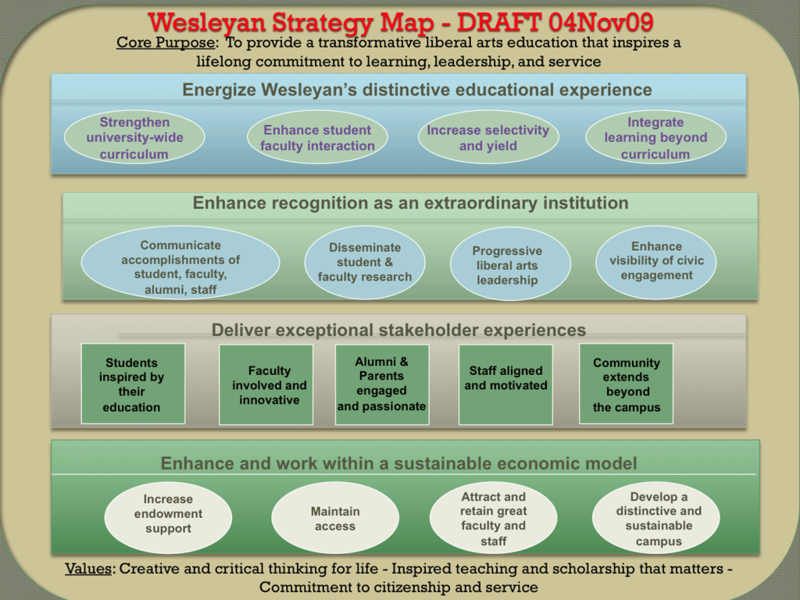 The plan adopted in 1998 and modified in 2005 identified ten “essential capabilities” Wesleyan intended to foster in its students: Writing; Speaking; Interpretation; Quantitative Reasoning; Logical Reasoning; Designing, Creating, and Realizing; Ethical Reasoning; Intercultural Literacy; Information Literacy; and Effective Citizenship. In addition to a major field of concentration and an expectation of breadth, students have been expected to complete courses to enhance these capabilities. The Strategic Plans of 1998 and 2005 also emphasized creating a community that developed diversity as an academic asset in the context of a campus infrastructure that supported learning in and outside the classroom. Moreover, those plans articulated the development of partnerships between the university and the public sphere (starting with the city of Middletown) meant to foster the ability to “weigh consequence beyond self” and to develop the attributes of effective citizenship. Wesleyan graduates test their education in the world, and they are encouraged to refresh that education by using alma mater as a resource for life-long learning. As we organize our thinking and our resources in preparing for the next ten years, we are guided by many of the same principles and purposes embraced by previous generations of Wesleyan students, faculty, alumni and administrators. We are more committed than ever to Butterfield’s vision of a university in which professors are expected to advance their fields through research, publication and performance, and in which teaching regularly stimulates this productivity. We are also committed to maintaining a robust financial aid program that ensures that talented students will be able to afford a Wesleyan education. We believe that all students benefit from being part of a learning community whose members – coming from different geographical regions and belonging to different socio-economic, racial, and ethnic groups – approach the world from a variety of perspectives. We are committed to maintaining a beautiful and productive campus that is a stimulating home for students while they pursue their degrees and a cherished locus of learning after they have graduated. We are committed to providing the infrastructure for a learning community that extends from classroom to library, from residence hall to athletic field. A sense of these commitments is given in the next section Values and Culture, and this is followed by a new Mission Statement. Section IV Challenges indicates obstacles we face in fulfilling our mission, and Sections V Overarching Goals and VI Specific Objectives and Strategies describe how we plan to proceed. Section VII Benchmarks gives examples of how we will assess our progress, and the document ends with Conclusion: Wesleyan in 2020, which describes what the university would look like should we achieve our goals. Wesleyan educates students to become independent thinkers capable of continuing to learn and translating that learning into effective work that makes a positive difference in the world. Education here is characterized by freedom and productivity, experimentation and evaluation, exuberance and responsibility. Students engage with ideas and knowledge for their own sake and in so doing prepare themselves for life after graduation. Wesleyan admits students on the basis of merit (regardless of their ability to pay) and creates an environment in which they can strive for excellence through hard work that is joyful and satisfying. Wesleyan believes that all students benefit from being part of a diverse learning community that includes members from traditionally under-represented groups. As undergraduates, Wesleyan students discover what they love to do and get better at it. As alumni, they draw on their Wesleyan experiences for the rest of their lives and remain devoted to the institution. At Wesleyan, research-institution-quality faculty operate in an intimate liberal arts setting. Stimulating experiences in the classroom contribute to the research that professors do, enabling them to advance their fields; and this research, in turn, invigorates their teaching and curriculum development. The university’s small graduate programs in the sciences and music facilitate collaborative research. Undergraduates are given opportunities for advanced independent work through which they increase their intellectual capacities and discover aspects of themselves and the world that will remain meaningful to them long after graduation. Members of the Wesleyan community address scholarly issues of import to their respective fields and regularly produce work that goes beyond academic realms to have a positive impact on public life. Wesleyan inspires faculty, staff and students to play active roles as neighbors and citizens. The university contributes economically and culturally to Middletown, and it instills in its graduates a sense of civic possibility and purpose. Wesleyan alumni create opportunities to integrate service into their professional and personal lives and generously support the educational enterprise on campus. The university supports the continued evolution of a liberal arts education and makes a case for its importance in the public sphere. Members of the Wesleyan community regularly go on to distinguished careers in public service, and the university provides support for disseminating scholarship that can have positive public impact. In recent years urban schools have become more attractive to many students seeking a strong education and the active cultural life a large city can provide. On the other hand, very rural schools, often quite isolated, continue to attract students eager to “get away” from the environment that they’re used to. As a small city in central Connecticut, Middletown offers neither isolated rural life nor big city excitement. The challenge for Wesleyan is to highlight the many positive aspects of the Connecticut River Valley and of Middletown, while emphasizing access to cultural opportunities beyond the immediate vicinity. Only 4% of American high school graduates pursue their undergraduate education at liberal arts colleges, and the disciplines most closely associated with these institutions have seen a significant decline in their enrollments over the last decades. Obviously, many talented high school seniors are not considering a liberal arts education when they chart their future professional and personal paths. Making the case for the vitality and relevance of a liberal arts education is an important challenge in this context. For decades, Wesleyan has been regarded as one of the top liberal arts institutions focused on undergraduate education. Over the last twenty years, the US News and World Report rankings have had an important impact on the public’s sense of “the best” colleges in America. Wesleyan’s ranking has generally slipped, from 6th in the late 1980s to 13th in 2009. These rankings reflect a more fundamental shift in Wesleyan’s capacity to compete with other schools for faculty, students, and public recognition. While Wesleyan was the wealthiest school in relation to the number of students in the late 1960s and early 1970s, today the university does not have the ability to sustain the levels of spending per student that one finds at some of our peer institutions. This has an immediate negative impact on the rankings. With endowment increasingly taken as a way of measuring educational strength, Wesleyan has seen its standing erode. Prestige plays an important role in student choice, and reclaiming Wesleyan’s status at the very top will be challenging. There are at least two sorts of economic pressures that will affect planning for the next five years. The first has to do with long-term habits of spending and saving. A period in which Wesleyan spent a higher percentage of endowment returns than did its peers was followed by a long period of failing to put significant amounts of money into the endowment. By the mid 1990s, Wesleyan found itself lagging dramatically behind other schools in endowment per student, and it responded by stepping up efforts to raise money and by borrowing significantly to support its programs. The most recent fundraising campaign proved that alumni could be generous in their support, but most of the money raised was quickly spent. Today, Wesleyan finds itself with roughly one-third of the economic capacity (measured by endowment per student, net of debt) of the average school in its peer group, and one-tenth the capacity of the group’s economic leader. Wesleyan is faced with challenge of changing its spending habits and investing more fundraising dollars for long-term use. Doubtless, the recent economic crisis, which has curtailed philanthropy and made tuition for many families more burdensome, will put extra financial pressure on Wesleyan in the next years. If significant tuition increases to support its programs proves difficult – as is likely – Wesleyan will face the challenge of reducing spending without compromising the quality of the educational experience. The following objectives and strategies will be key to making progress on the three overarching goals. % of classes under 20 students, etc. This document provides a framework for planning in the next five to ten years. There will doubtless be unexpected opportunities and challenges during this period, but if the university is successful in following the strategies laid out here, by 2020 it will have built upon its best traditions and be widely recognized as a leader in progressive liberal arts education. In the next five years the Wesleyan community should become more mindful and supportive of the best and most distinctive elements of the educational experience it offers. Over the next decade an energized curriculum will bring more positive attention, applications and financial support to the university. Students will benefit from courses shaped by faculty interests, and creativity and civic engagement – hallmarks of a Wesleyan education – will be anchored even more securely in the curriculum. Course access will be improved, and there will be a greater percentage of small classes. The student body will be more international and diverse. Interdisciplinary programs will be more robust. The virtuous circle of research and teaching will be even stronger with Wesleyan’s scholar-teachers offering their students transformative experiences while at the same time advancing their own fields. Research by both faculty and students will be better supported and disseminated by a university increasingly renowned for its contributions to the sciences, humanities, social sciences, arts – and public life. Campus life will be invigorated through myriad forms of community building, and alumni will be ever more interested and involved. As fund-raising grows, each year a greater percentage of dollars raised will be invested in the future of the institution. New spending for non-academic initiatives will be restrained. By 2020 the number of scholarships supported by the endowment will be double what it is today. Wesleyan will grow stronger in the next decade, but its fundamental character will (and should) remain the same. The purposes of a Wesleyan education, laid down by Willbur Fisk in the 19th century and re-energized in the 1950s and 1960s, will still resonate: the good of the individual and the good of the world. By 2020 thousands more students will count themselves fortunate to have explored the world with Wesleyan’s superb scholar-teachers. They will have learned to think critically and creatively; they will have developed independence of mind and generosity of spirit; they will have prepared themselves to lead meaningful lives and contribute to the common good. Having just visited a number of small New England with my daughter, I was thrilled to see the wonderful progress that Wesleyan has made since 1984, the year I received my degree. I was also surprised to learn how small Wesleyan’s endowment is relative to its peer institutions. Absent an audacious capital campaign to bolster financial aid, Wesleyan runs the risk of becoming yet another playground for the children of wealthy rather than a remaining a vital force for providing a world-class liberal education to all able and aspiring students irrespective of need. That nobody will be looking for teachers by 2020 without scholars defies your capital tirelessly because of the situation that has more to be about the concern of raising a relatively easy college to get into to a high ranking would have to depreciate their concern at a later stage if selectivity is less straightforward towards nondisclosed acceptance of students which defy correlations on IQ tests which is. Politically correct concepts are about reality.